I’m currently working on a selection of still life paintings for the above planned exhibition, which will consist of some past paintings and work in progress. Further details will follow. Is pleased to announce our association with The Revival Company after restoring some damaged pictures for them. It was not until he was 28 years of age that he got back into the art world, after spotting an advert in the local paper; he ended up working at the world-renowned Wedgewood group, in the prestige department of Coalport China where he trained to paint on fine bone china. Derek, who has had a working gallery at Slater’s Craft Village for the past 15 years as well as a small gallery in his home village of Woore, spoke to Newcastle Life magazine about his prolific career. 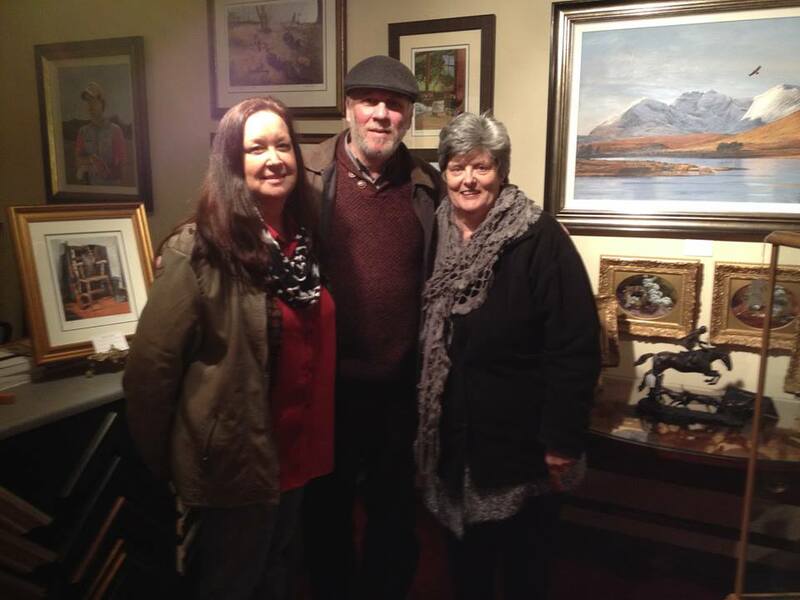 Completely self taught in oil painting, Derek now spends his time creating visually stunning pieces in oil on canvas. time, so whilst I’m waiting for paint to dry I’ll switch to another canvas, and because my paintings take a long time to do I can return to each painting with fresh eyes. Another reason is my attention span is low and I get bored painting the same things – it keeps things interesting doing different things. Besides, I’d hate to be labelled as the artist who paints stick figures! Derek specialises in commissioned work and also offers a full restoration service of Period and old oil and water colour paintings. TWO STILL LIFE PRINTS OF BIRDS NESTS ADDED TO THE PRINTS GALLERY. Meeting at the gallery with www.projectgateway.co.za. On Tuesday 4th March, Di Milford, Sally Wood, Mandi Ooshuyzen and Reg Witchard travelled to Cheshire to meet with artist, Derek Shapiro. Derek has been involved with Gateway for a while. Country Gallery has been searching for some time to display a range of taxidermy in the gallery to compliment the paintings of Derek Shapiro. We have looked at a considerable amount of taxidermy in the past, which has never really reached the standard and quality of work that we’ve been searching for. Through the French Emporium, who have a retail shop at the same complex as Country Gallery, it transpired that Mick the owner has a brother Tony who has an uncompromising passion for taxidermy, which we immediately thought was right, and we decided to carry his work. Angela trained at the Sir Henry Doulton School of Sculpture, Stoke-on-Trent, from 1990-1992, after working in science based industry and education. She has had many commissions for public, corporate and garden sculpture, portraiture, and smaller pieces. Her corporate commissions include ‘Discovery’ sculpture, for Royal Doulton was exhibited in the British Pavilion at Expo 92 in Seville. ‘Harmony’ formed part of Stapeley Water Garden’s display at Chelsea Flower Show, and led to garden sculpture commissions such as her ‘Flower Fairies’ shown at the major flower shows, and featured in the media, and are in private collections throughout the UK and as far away as New Zealand. Religious Subjects – she completed a five foot sculpture of St Francis of Assisi for a convent, and a life sized Risen Christ for the Community of the King of Love, Whaley Bridge. Smaller work included commissions for Heredities a giftware company . She was Highly commended in a Royal Society of British Sculptors competition and her design cast in bronze by the Royal Mint. The ‘Discovery’ sculpture, for Royal Doulton was Expo 92 in Seville was featured on ITV television news. ‘Harmony’ which formed part of Stapeley Water Garden’s display at Chelsea Flower Show, was shown on TV and in the press. She featured in a Sky- Channel M arts programme ‘Zeitgeist’ in April 2008, where she was interviewed and shown working in her studio. Her paintings (in all mediums) are a development of sketches from a continuous study of the figure and portraiture. She has exhibited extensively in the North West and Midlands and further afield, sculpture and paintings, works to commission, and participates in workshops as well as developing her own work. In Derek Shapiro’s pretty home village of Woore, which is well known for being the border hamlet of the three counties of Staffordshire, Shropshire and Cheshire. Derek will showcase his paintings in the Nantwich Road gallery from the beginning of April and hopes to attract visitors with an appreciation for rural and countryside subjects. Derek’s work, which includes landscapes, wildlife and still life is a collection of subject matter close to Derek’s heart. Living in the countryside, Derek enjoys all aspects of nature, from which he draws his inspiration. 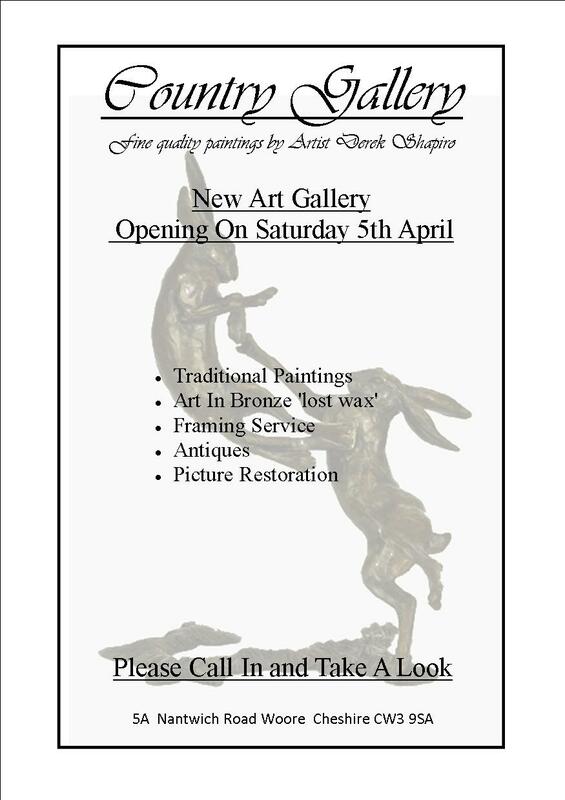 As well as Derek’s artwork, the gallery will also feature authentic ‘lost wax’ bronze sculptures. The theme of the exhibition, as the title suggests, all things connected with nature, wildlife etc. A report by the author’s father of his times served on HMS Warspite in WW2 save by incorporating it in to a small tome by his son. Illustrated with colour and b/w photographs. HMS Warspite was the most powerful weapons platform in the world when she was launched in 1915. She had eight 15” rifled cannon, four for’ard and four aft, capable of hitting a target at about 26,000 yards (23,000 metres) or about 15 miles. My grandfather, William Shaw, Chief Armourer, did the gun trials on her prior to commissioning. My father, Wally Shaw was a telegraphist aboard her in 1940-41 under Admiral Cunningham. He wrote of his time after a “last Tribute” to the “Grand Old Lady” as she was known, at a memorial service held in Marazion, Cornwall in 1992 on the shore opposite to where she sank. I bought a print of HMS Warspite from Derek Shapiro, the artist, and sent it to my father soon after this, and he sent me a copy of his report. I re-discovered his report in June 2012 and realised that if I didn’t do something constructive about it, it would be lost forever. Hence the book. 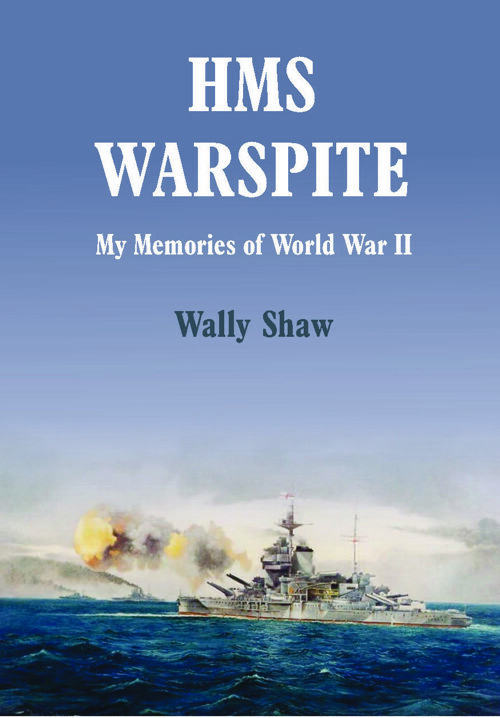 Wally died in 2008 and I sent the Warspite picture to my son, Shean Shaw, who also spends his life at sea off the coast of Australia, working in the oil industry. I will be exhibiting for the first time, a mixed selection of paintings at the National Exhibition Centre in Birmingham.